This is based on the classic style of making the wine. Chardonnay traditionally had months in an oak barrel, which rounds out the flavor and gives the wine more body. Some modern Chardonnays however are fermented and stored only in Stainless Steel and so produce a wine with much lighter, crisper flavors. This influences the time the wine can be cellared and the temperature at which it is best served. Syrah, typically a very heavy wine from the Rhone area of France is also produced in a heavy bodied version in the new world and often called Shiraz. Reds are rated from Light, something like a well balanced Pinot Noir to Very Heavy, a Petit Verdot for instance. Whites are weighted from Medium a well-rounded Chardonnay to Very Light, like a Pinot Gris. 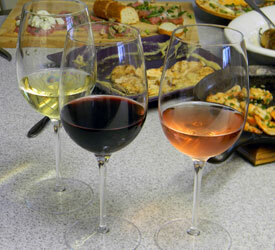 Note that a Light Red wine is still going to be heavier than a Light White wine. To find wines that have a desired structure, click on the “Encyclopedia Varietal Report” button, (2nd button down on the left) and use Winery-Sage.com’s powerful database and filter tools to find the perfect Varietals.